U.S. President Donald Trump and first lady Melania Trump are welcomed by Saudi Arabia's King Salman bin Abdulaziz Al Saud at Al Murabba Palace in Riyadh, Saudi Arabia May 20, 2017. Picture taken May 20, 2017. Bandar Algaloud/Courtesy of Saudi Royal Court/Handout via REUTERS ATTENTION EDITORS - THIS PICTURE WAS PROVIDED BY A THIRD PARTY. FOR EDITORIAL USE ONLY. As FLOTUS, Melania Trump is one of the most talked about - and mysterious - women in the world. And as she becomes increasingly private in a very public role, with virtually no official duties confirmed, the added scrutiny Mrs Trump faces during her rare public appearances are nearly always focused on her wardrobe. The 47-year-old is undoubtedly impeccably dressed with never so much as a hair out of place, a trait which she is believed to have developed as an aspiring model in her native Slovenia, and she is never pictured in anything less than head-to-toe designer garb from the biggest fashion houses in the world. 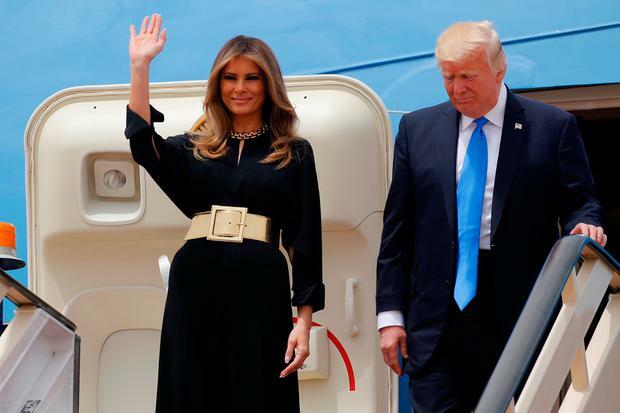 For her first international trip with husband President Donald Trump, the mother-of-one has been largely praised for maintaining a balance of respectful hemlines and sleeve lengths in the first leg of their trip in the conservative (re: oppressive) Saudi Arabia. But some think there's more to her choices from those first few days - namely her decision to not wear a headscarf, a move in which she was aligned with her step-daughter Ivanka. Saudi law which requires women's hair must be covered in public, but visiting dignitaries and their families are exempt. Women are also not allowed to drive, can only partially vote and must have a male guardian oversee all of their affairs, including accessing healthcare. Pseudo-feminist Ivanka praised the progress being made among the glacial-moving women's rights campaign and an incoherent answer on the women being banned from driving in the region. At an event speaking with female leaders in Riyadh’s Tuwaiq Palace, she said: "In every country, including the United States, women and girls face challenges. Saudi Arabia’s progress, especially in recent years, is very encouraging, but there’s still a lot of work to be done." "Women driving is not a religious issue as much as it is an issue that relates to the community itself that either accepts it or refuses it." 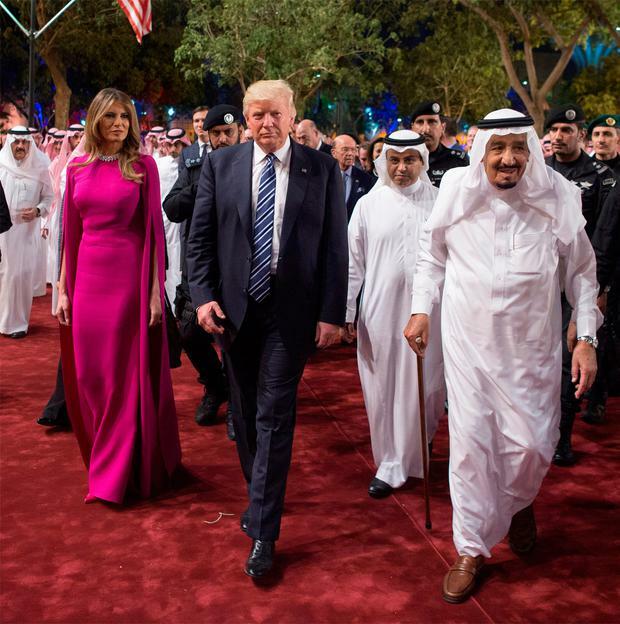 But back to Melania's impeccable style - for her final night, she opted for a white Dolce & Gabbana suit with snakeskin Manolo Blahnik heels at the Arab Islamic American Summit. 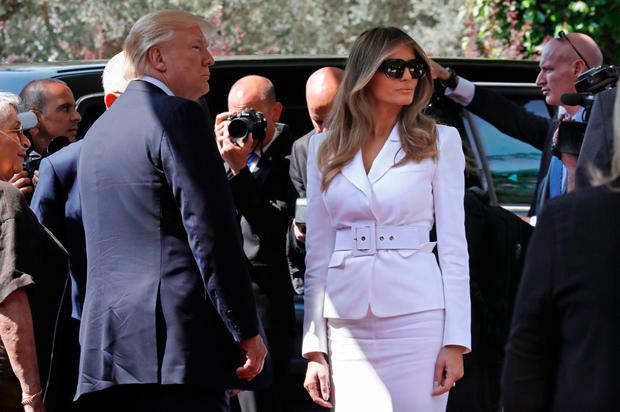 The suit is being interpreted as a nod to her assumed-feminist ideals, at least according to Pret-a-Reporter, who described the choice of a pantsuit as "notable, maybe even pointed, suggesting that Melania wanted to convey that she had just as much a right to be in the room at the summit as any of the men". Vogue praised her "modest" style during the brief trip, referencing her first outfit - a Stella McCartney jumpsuit "that recalled the silhouette of a traditional abaya". Just last week, French first lady Brigitte Macron was likened to her American counterpart for choosing a similar shade of powder blue at her husband's inauguration, bearing more than a passing resemblance to the Ralph Lauren ensemble Melania wore on January 20, a shade which has now apparently been dubbed 'Melania blue'. In the first days after her husband's swearing in, fashion experts poured over the possible meanings of her wardrobe choices: was white a nod to the suffragette movement? Was her pussybow blouse on the campaign trail a silent denouncement of her husband's infamous "grab 'em by the p***y" comments? Was her inauguration gown an "implicit message about cooperation and embracing the melting pot?" (as per the New York Times). At the end of the day, like most considerations about Melania - they're all speculative, with little to no public admissions of her private passions, causes or even as much as a hobby, she remains largely an enigma. And so does her wardrobe.